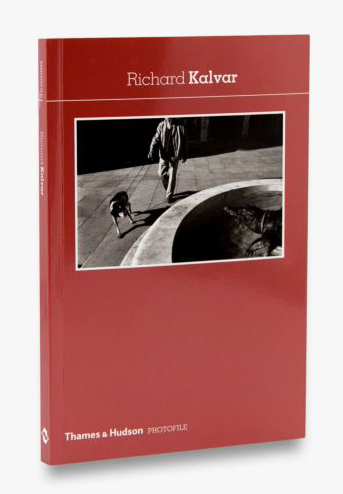 Book Of The Week Richard Kalvar (Photofile) Photographs by Richard Kalvar Reviewed by Blake Andrews A concise, informative overview of more than four decades of work by this Brooklyn-born Magnum photographer. 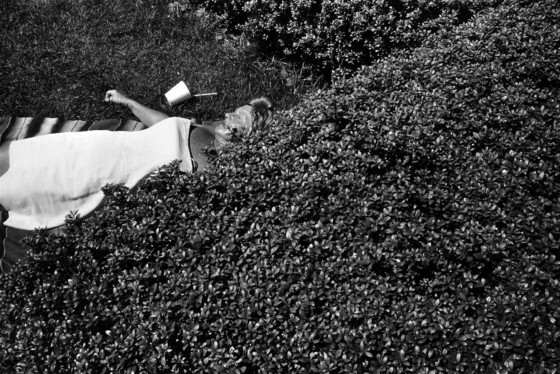 This latest volume in the Photofile series assembles the experimental, unforgettable moments captured by Richard Kalvar in one accessible volume. 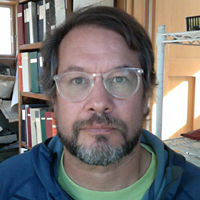 Richard Kalvar (Photofile). By Richard Kalvar. Thames & Hudson, London, United Kingdom, 2019. 144 pp., 64 duotone images, 4¾x7½x½". Photobooks have come a long way since 1982, the year Robert Delpire began his Photo Poche series as a "free course in the history of photography". Back then the idea of an inexpensive pocket ("poche")-sized survey was perhaps less contrarian than it might be in today's lofty book scene. But they were still off the beaten track. The small paperbacks were a simple antidote to more cumbersome coffee table monographs. Delpire devoted each edition to one photographer, editing his or her oeuvre down to 64 photos, one per page, simply captioned in sequence. For those unfamiliar with a certain photographer, Photo Poches were a way to get up to speed with their “greatest hits.” In style and presentation, they were a sort of pocket-sized proto-Instagram: inexpensive, accessible, and fleeting. Delpire came out of the gate with a murderer's row of heavy hitters. First in the series was the French great Nadar, followed by Cartier-Bresson, Lartigue, Lange, and Doisneau. More luminaries followed. Smith, Frank, Davidson, Atget, etc. At this point, there have been over a hundred in the series, and Photo Poches became a de facto Hall of Fame for photographers, at least among those of a certain modernist documentary stripe. The format works especially well for photographers communicating in single frames. 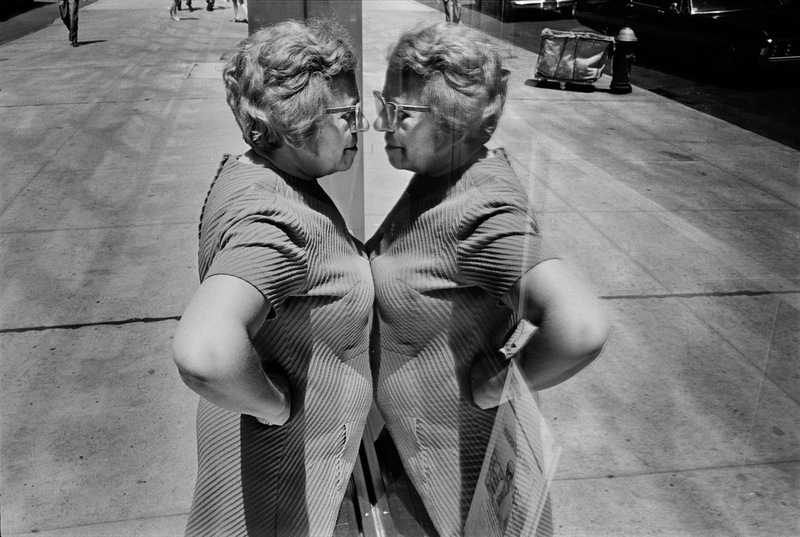 Classic street photographers run heavy in the mix. One of the final photographers added by Delpire, before his death in 2017, was the Magnum photographer Richard Kalvar. 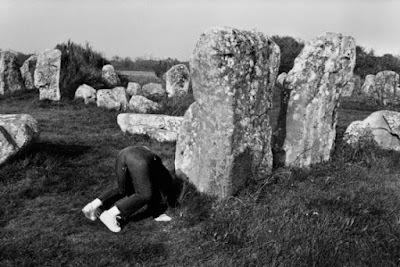 His Photo Poche, published in 2018, was a highlight reel of poetic absurdism. But alas, the text was in French. In April 2019 the English version will be published by Thames and Hudson as part of their sister series, Photofile. These books are essentially similar to the original Poches, but with English captions, a different color scheme, and no series numbers. The Brooklyn born, Paris-based Kalvar, 74, is a master of the serendipitous moment. At this point he's been shooting for over fifty years, and built up a stable of reliable keepers. From this stash, Delpire cherrypicked his favorites, then sequenced them to emphasize formal connections. A photo of men sitting around a bench is followed by one of a prone man near another bench, followed by a prone man descending into bushes, and so on. The assorted mix bounces easily from year to year, subject to subject, place to place, inferring a hidden order without ever seeming heavy-handed. High-handed art theory be damned. The emphasis here is on looking and seeing, a simple affinity for the world and its delightful quirkiness. 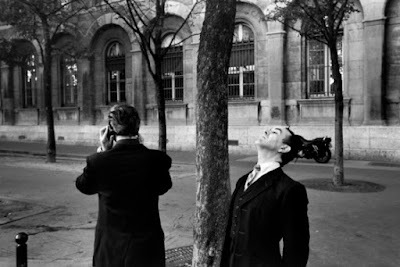 Kalvar generally captures people and their surroundings. People in conversation are a recurring subject, as are strong gestures. 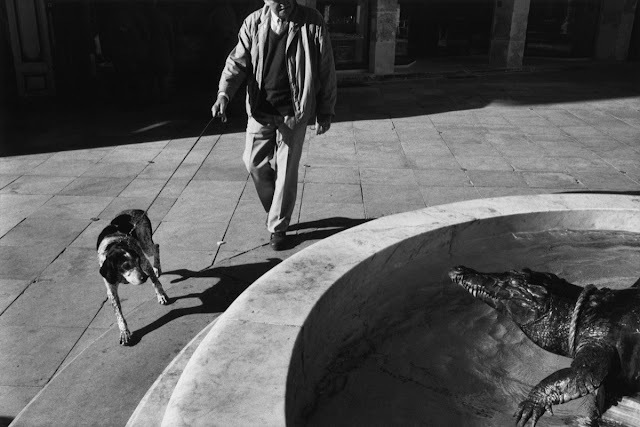 Occasionally animals are substituted—dogs are a particular favorite—while some photos are inhabited only by form and texture. A photograph of light streaking a brick wall, for example, seems animated with life. Bushy vegetation is another Kalvar favorite. So are bare limbs, serendipitous pairings, prone bodies, and enigmatic relationships. Sometimes the moments are sheer one-off wonders, coke-bottled glasses near a fountain, for example. Or a popsicle/foot/guitar juxtamiracle. Regardless of subject matter, Kalvar captures his world with the deft touch of a keen observer. His glance is offbeat, the subjects often hidden. Converted into traditional monochrome his classic style falls nicely in line with former Photo Poches by Erwitt, Friedlander, Ronis, Kertesz, and Brassai. If all of this sounds vaguely familiar, you might be remembering Earthlings. This was the Kalvar monograph published by Flammarion in 2007 (his first and only book at the time, unbelievably). Considering that the book was edited and sequenced by another editor (Kalvar himself) ten years before, it's astonishing how similar the material is. The two books share roughly 2/3 the same content, and a similarly loose style of sequencing. Earthlings is the more lavish production, printed larger with more photos. It's a book you can dig into and get right on top of the photos. But its purpose is essentially similar to the new Photofile, a "greatest hits" summary of Kalvar. For those wanting a quick introduction to his work, either title is sufficient.